It is advised to manage one vCenter by only one vOneCloud (ie, do not manage the same vCenter from two different vOneClouds). Otherwise VMs from both server will clash and produce errors. The IP or DNS needs to be known, as well as the credentials (username and password) of an admin user. Ideally, all ESX belonging to the same vCenter cluster to be exposed to vOneCloud need to share at least one datastore among them, although this is not a hard requirement. VMs that will be instantiated through vOneCloud need to be saved as VMs Templates in vCenter. vOneCloud only creates new VMs by instantiating VM Templates. IE (>= 9), Firefox (> 3.5) and Chrome Other browsers, including Safari, are not supported and may not work well. Note that IE11 is NOT supported with compatibility mode enabled. 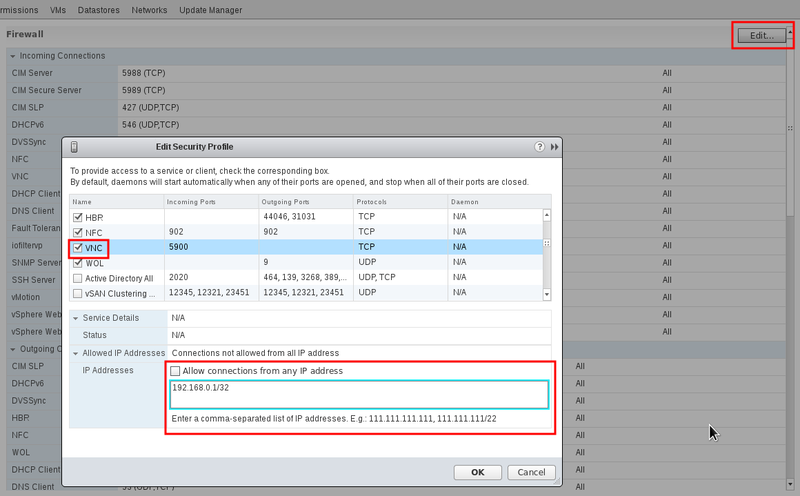 To enable VNC functionality for vOneCloud, repeat the following procedure for each ESX. The following package adds the VNC ruleset (port range 5900-65535) and permits access to these ports. Also, make sure that the ESX hosts are reachable from vOneCloud.